Tough and ready for the long haulThis new track system reaches the next level of performance in any conditions. 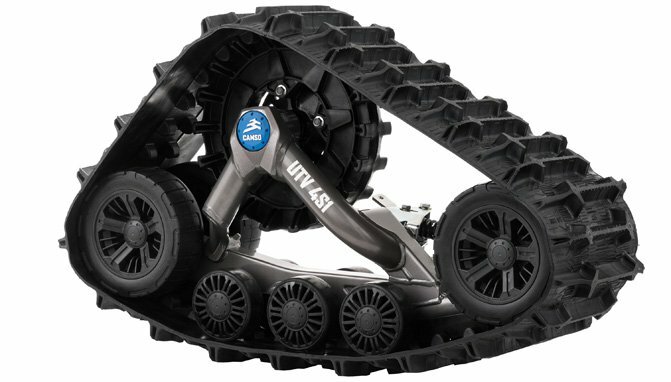 You simply won’t find another track kit offering this level of ride quality, performance, durability in any applications including deep snow, swamps, marshes, mud and muskeg. Snow, steep terrain, rocks and branches, desert sand, muddy creek beds–all of these things can pose huge challenges for wheeled All-Terrain Vehicle (ATV) , Utility Vehicle (UTV), Side-by-Side (SxS) or Razor (RZR), especially those weighted down with gear. In contrast, rubber tracks for these vehicles offer increased traction, reduced ground pressure per square inch, and better flotation. In short, rubber traction systems offer far better mobility for all terrain vehicles in challenging environments. At www.atvtracks.net, you’ll find the best prices in the marketplace on these versatile UTV track systems for all kinds of All-Terrain Vehicles (ATVs), Utility Vehicles (UTVs), Side-by-Sides (SxSs) or Razors (RZRs). We test everything we sell, and the bottom line is we sell only the best. Give us a call, and find out which track system is right for your needs! Why not take your All-Terrain Vehicle (ATV), Utility Vehicle (UTV), Side-by-Side (SxS) or Razor (RZR) on your next hunting adventure? No matter what sort of game you’re after, your off road vehicle can help you fully enjoy the sport of hunting by allowing you to get from one place to another quickly. You’ll find the amount of ground you can cover is greatly increased. Click Here for Track Systems! If you’ve ever tried to take your All-Terrain Vehicle (ATV), Utility Vehicle (UTV), Side-by-Side (SxS) or Razor (RZR) with you on challenging terrain, you’re already aware of the potential pitfalls. To overcome these difficulties, simply invest in a high-quality track system for your off road vehicle. You will be able to take on uneven landscapes with ease after you’ve installed your new tracks. Equipping your All-Terrain Vehicle (ATV), Utility Vehicle (UTV), Side-by-Side (SxS) or Razor (RZR) with a track system is especially beneficial if you like to hunt quail, duck, geese, or any other type of bird. Once your game goes down, you can get to it quickly and easily by using your vehicle. Hills, mud, and even snow will be no obstacle when your off road vehicle is outfitted with a track system. Since some track systems even provide up to 95 percent of tire speed, you’ll be impressed at how fast you can get to your trophy, no matter how far away it is. For superior service from a company you can trust, turn to ATVTracks. Our staff is ready and willing to help you select the perfect track system for your vehicle. We even try to keep most of our tracks in stock so they can be shipped the same day you place your order. Come see our selection for yourself at www.ATVTracks.net. When you’re ready to place your order, one of our helpful customer service representatives will be more than happy to assist you. Contact us today at 1-866-243-8359. If you’re in the business of selling All-Terrain Vehicles (ATVs), Utility Vehicles (UTVs), Side-by-Sides (SxSs) or Razors (RZRs), ask about our dealer programs. Idler & mid-roller Wheels/Tire 132 mm double-bearing mid-roller wheels (width: 50 mm) 241 mm double-bearing flat free tires. Bladder-type wheel cap and face seal. Hub and bearing Oiled 3-bearing with forged steel multi-bolt. (4-5) pattern hub. Tandem & suspension Rubber mount steel tandem. Rubber mount aluminium shaft axle. Maintenance free.